Carotid artery disease is a very serious medical condition because it can go unnoticed and because blockage in the carotid artery only increases with time and can cause a stroke if left untreated. 3 Million Americans are currently suffering from personal and financial losses because of the physical and mental disabilities caused by stroke. Out of the 795,000 yearly strokes that happen in the United States, approximately 636,000 of them were related to carotid artery disease. Carotid artery disease is one of the deadliest vascular diseases affecting Americans today because it has unexpectedly taken the lives of thousands of people through stroke. Carotid arteries are the major arteries in the neck that supply oxygen-rich blood to the brain. When the carotid arteries become clogged or constricted by a build up of plaque (a sticky substance made up of cholesterol, calcium and fibrous tissue), this is a serious medical condition known as carotid artery disease. 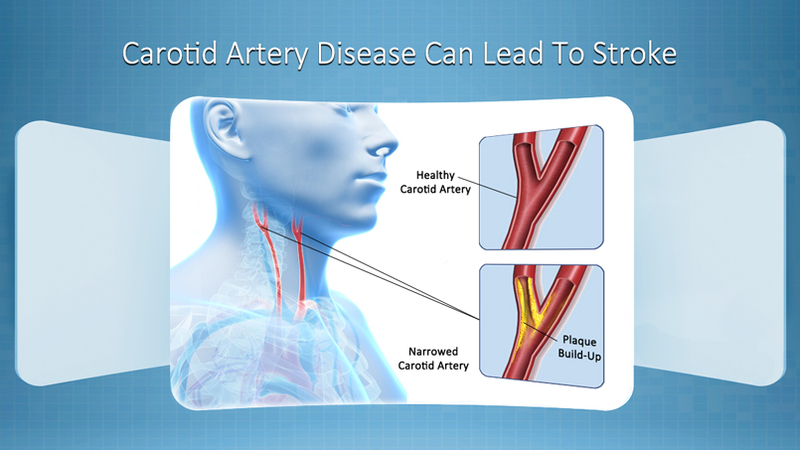 Clogged or constricted carotid arteries are very dangerous because they limit blood flow to the brain. Limited blood flow to the brain reduces brain function and also increases the risk of having a stroke, which can cause severe disability due to permanent brain damage and can even cause death. Carotid artery blockage develops as you age. Ten percent of adults between the ages of 80 and 89 suffer from carotid artery disease, but only one percent of adults between 50 and 59 suffer from it. Also, blockage in the carotid artery is higher in people who smoke, have diabetes, high cholesterol, or high blood pressure. People who do not exercise and have poor nutrition are at a higher risk of developing carotid artery disease. People who have a family history of Atherosclerosis (hardening of the arteries) or stroke are also at higher risk for developing carotid artery blockage. In addition, men are more likely to develop the disease than women. Unfortunately, someone could have carotid artery disease and show absolutely no symptoms. One of the warning signs of carotid arterial disease, is the occurrence of something called a “mini-stroke” (or transient ischemic attack – TIA). A TIA is a temporary episode where a person experiences numbness or weakness in the arm, leg or face on one side of the body, loss of vision in one or both eyes, difficulty understanding what someone else is saying, slurred speech, difficulty talking, a loss of coordination, dizziness or confusion and/or trouble swallowing. This episode can last just a few minutes, or can continue for up to 24 hours. If you have ever experienced any of the symptoms related to TIA, it is highly recommended that you consult with a vascular surgeon as soon as possible to determine if a vascular ultrasound may be necessary to see if you have any blockage in your carotid artery. Carotid artery blockage will only worsen with time, leading to a stroke, which can be fatal or that could leave you disabled for life. Controlling factors that increase your chances of developing carotid artery disease, such as diabetes, high blood pressure, or high cholesterol, can also help prevent the disease. Carotid Ultrasound (also known as a “Carotid Duplex” or a “Carotid Doppler”) is performed to examine the health of the carotid arteries and to find out if any blockage has developed and to what extent the blockage has progressed. Sometimes the ultrasound does not give enough information about the extent of blockage in the carotid arteries and your physician will recommend that a Carotid Angiography be performed as well. During an Angiography, a contrasting dye is injected into the bloodstream so that the carotid artery can be more easily viewed and examined by x-ray. Another technique for diagnosis is through Magnetic Resonance Angiography (MRA) where pictures of your carotid artery are taken using a large magnet and radio waves. Yet another technique for diagnosis is Computed Tomography Angiography or CT Angiography, where a computer is used to produce two-dimensional and three-dimensional images from x-ray pictures of your carotid arteries. 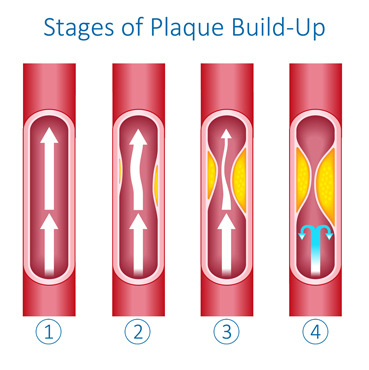 All these methods of diagnoses help the vascular specialist determine how much the blockage of the arteries has progressed and gather more details of a person’s carotid artery disease. Depending on the extent of the blockage of your carotid artery, our Riverview vascular doctors may simply recommend lifestyle adjustments, medication, non-surgical invasive procedures or, as a last resort, carotid artery bypass surgery. The non-surgical methods that our vascular surgeons use offer quick recovery time, leave minimal to no scars and restore healthy blood flow to the brain, eliminating the risk of stroke. To find out more about carotid artery surgery and to make an appointment for a consultation with the Board Certified Vascular Surgeons at The Vein & Vascular Institute of Riverview, give us a call today at (813) 999-3992 because carotid artery disease only worsens with time and can unexpectedly lead to a stroke.